Decor is necessary for some animals and plants to feel at home. Shy fish look for permanent hideaways in it, while others find the refuge they need to reproduce, laying their eggs on vertical or horizontal rocks. Even if the residents do not make use of the shelter provided, the decor gives them physical reference points, which allow some species to mark out their territory. These observations are equally applicable to invertebrates, some of which - Anthozoans, for example - live attached to elements in the decor. When an anemone is first introduced into an aquarium, it is not unusual to see it move around before establishing itself in the spot best suited to it. The decor also provides a support for certain types of vegetation: ferns and moss in fresh water, Caulerpae, and other algae in sea water. 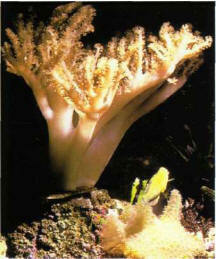 In sea water, the decor can sometimes serve as a support for the invertebrates that live attached to it. Finally, the decor allows you to hide equipment, mask the glass panes, and cut off the rear corners, thereby providing a backdrop and bringing harmony to the aquarium overall. Apart from the search for a visual effect and a natural look, some rules must be respected when you are designing your decor. It must be functional, accessible, and easy to maintain. The material used, except in rare cases, must be neutral, i.e. it must not modify the characteristics of the water. It must also be solid enough to resist fish like Cichlids, which like to rearrange the furniture. Of course, the decor increases the weight of the aquarium. Calculate for an average of 60 kg per square meter, although it will be a great deal less if you are using artificial materials, in freshwater tanks that are densely planted, Dutch aquarium style, and in marine tanks. Once again, do not forget that the decor must be put in place before the bed is laid.